Today we slept in and then went to the city to the Antique Show and Flea Market. I had a blast, but it would have been nice to have a more enthusiastic compantion. My Farmer is a good sport and took me, but he was about as thrilled to be there as I am going to farm stores. 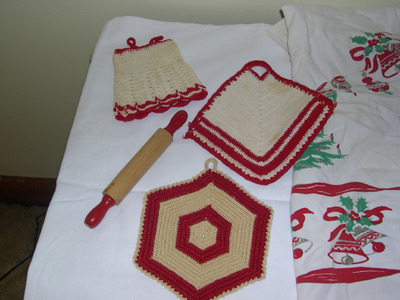 Red & White crocheted potholders & a red-handled child's rolling pin. All so sweet! 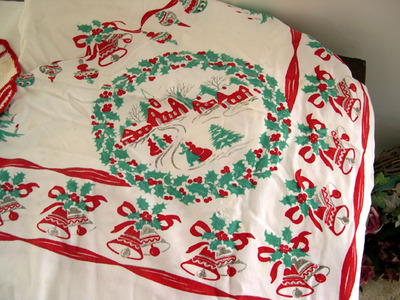 I absolutely LOVE this rectangle Christmas tablecloth from the 1940s(?)!! It was under a bunch of displayed items in a booth and I could not believe the vendor did not have it out for sale! I've seen these go for $30+ at auctions. My dickered down price...$7! (and the vendor even had to move all his stuff off the top of it first.) It is a bit stained and only has one little frayed spot. Did I tell you I LOVE this piece! Ok, and now the Deal of the Day!!! 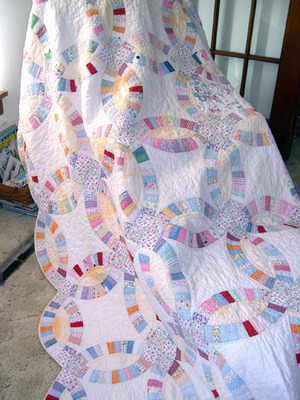 My photos don't do this quilt justice, I'm afraid. Will have to hang it on the clothesline later and really show it to you. I saw this quilt on a vendor's chair but the vendor was MIA. I figured I was not suppose to have it and judging from the prices in his booth I figured it would be way out of my price-range. Later when we had to wait for the tablecloth vendor to unbury the tablecloth above, I decided to go back to see if the quilt was still there. I am so glad I did! The vendor was very nice and quoted me a price of $45! Be Still My Heart!! I had estimated the lowest he'd go would be $65. Then he showed me the 2 "repairs." On 2 of the rings, someone had machine stitched a square of weird printed material and a square of white on the back. I'm guessing there is a small tear or hole in those spots. Thankfully they only covered the spot and didn't cut it out. I can see the original piecing behind the patch. So this very nice, HONEST vendor, showed me those spots and how it is stained. Then he says he'll take $40! I was about ready to hyperventelate then... lol Just to see what I could do, I asked him if he'd take $37 and he said YES! I could not belive it! Other than those 2 spots this is a beautiful quilt. It is not thinned nor frayed on the edges. 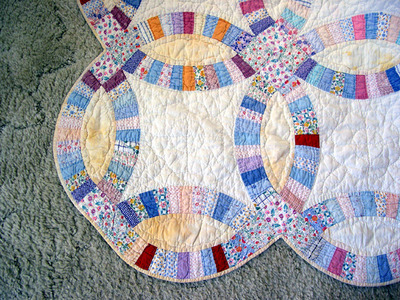 It is hand-quilted and the colors are bright. The patches seem to be from the 1930s or 1940s. Maybe feedsacks? I looked at a couple of other quilts at other vendors but the lowest I found was a twin-size summer coverlet (Snowball pattern in white, black and blue print) for $65 and a 12" Friendship star block double-size quilt with badly frayed edges for $35. Next time I'm bringing more $$$$! Total spent today- $50, which was how much I brought along.